The SARS epidemic demonstrates how a delay in reporting and an incorrect diagnosis can allow an epidemic to spread. Initially, the Chinese government misdiagnosed the infectious agent as Chlamydia and underestimated the ease of transmission and potential dispersal throughout the region. Epidemiologists from the WHO were not permitted into the Guangdong province until May 2003, but by then the virus had spread all over the globe. Investigators were distracted by reports of fatalities from a virulent strain of avian influenza, which had resurfaced in Hong Kong in late February 2003. Also, the human metapneumovirus, which also causes respiratory illness, had been identified in cell cultures inoculated with some samples from SARS patients. It was later concluded that the newly identified coronavirus was responsible for SARS, and the metapneumovirus was simply circulating concurrently in some populations. It is important to find the natural reservoir of the SARS-CoV to prevent its reintroduction into the human population. Retrospective epidemiology of the initial outbreak in Guangdong, China revealed that early cases were local restaurant workers handling wild animals. Investigators tested animals from local marketplaces and performed a serological survey of animal handlers. The SARS-CoV was isolated from the Himalayan palm civet, and antibodies were detected in a raccoon-dog and a Chinese ferret badger as well as some animal handlers. 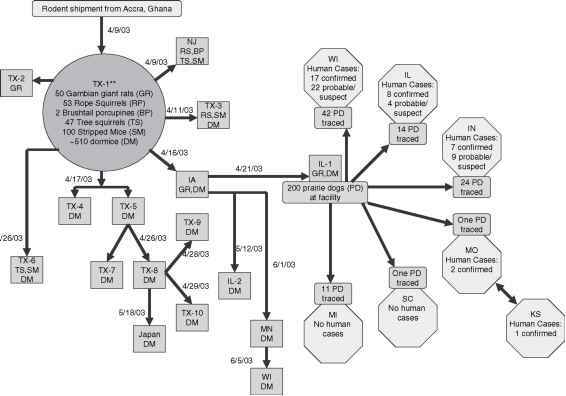 The sequence from the palm civet contained a 29-nucleotide region that was not present in the genomes of virus isolated from the SARS epidemic.47 It is unknown whether this region contributed to the transmission to humans. It cannot be assumed that the palm civet or other animals in the marketplace are the actual natural reservoir or just infected bystanders. The future of SARS is uncertain. We still do not understand the natural history of the SARS-CoV We cannot predict whether and when the virus will reemerge. 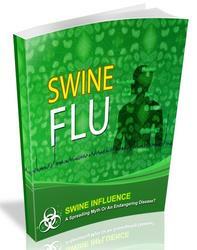 The virus may cause seasonal outbreaks or establish endemic disease in rural health care settings. Researchers are assured the virus will appear again and are working to find therapies and a vaccine. The following case illustrates how trace-back investigations can determine how an African virus infected 81 people across the Midwest in the U.S. On May 20, 2003, in Wisconsin, a young girl was taken to the hospital with a rash and raised fluid-filled bumps on her hand that formed after a bite from her pet (Figure 4.6). The doctor who treated her suspected that the girl may have been infected with either the plague or tularemia. Shortly thereafter, both the mother and father became infected with the unknown agent. 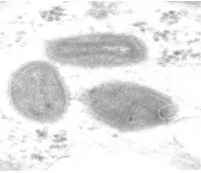 On May 30, 2003, upon viewing EM micrographs of the mother's biopsy as well as cell culture, state doctors believed the infectious agent was a member of the orthopoxvirus genus. 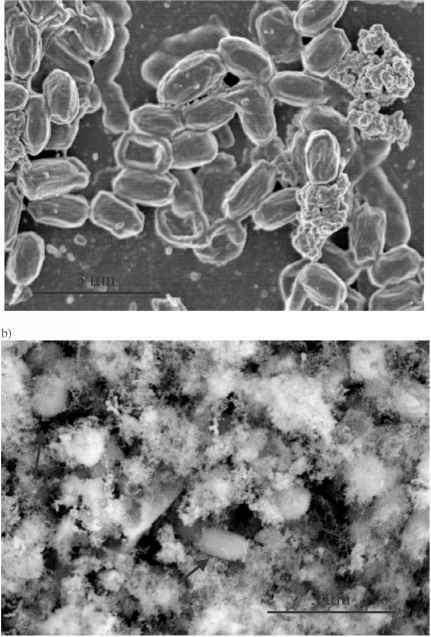 The EM micrographs (Figure 4.6) were useful in identifying the genus of virus, but were also of limited use for species identification because all members of the orthopoxvirus genus have similar morphology. The agent could have been any member such as cowpox, vaccinia, monkeypox, or even smallpox. On June 6, 2003, local clinicians were able to culture the orthopox virus obtained from the pet prairie dog's lymph nodes. Samples were quickly sent to the CDC in Atlanta, Georgia for identification. figure 4.6 (A) Monkeypox skin lesion on a young girl's right hand. (B) Electron micrograph of orthopox virus cultured from her mother. Courtesy of the Marshfield Clinic, Marshfield, Wisconsin. Wisconsin, Illinois, Indiana, Missouri, Ohio, and Kansas. Patients showed signs of rash, fever, cough, and headache, among other symptoms. As the patients were interviewed and information gathered, a common feature became apparent. Most patients had contact with exotic pet prairie dogs. On June 8, 2003, the CDC positively identified the virus as monkeypox. In the U.S. outbreak several states linked the purchases of the prairie dogs to particular pet stores. The trace-back investigation revealed all of these pet stores purchased prairie dogs from a distributor in Illinois. Through PCR-based genetic testing, the CDC uncovered prairie dogs at the Illinois dealer tested positive for monkeypox. How did these prairie dogs become infected with a virus native to Africa? This distributor, on April 21, 2003, received a shipment of African Gambian rats and dormice. These were then tested by the CDC, and found to be infected with the virus. Investigators then were able to track the rodent shipment to a Texas distributor, which was the initial point of entry for several rodent species imported from Ghana on April 9, 2003. Several of these imported animals were infected with monkeypox. Finally a source for the monkeypox entry into the U.S. was located. A schematic illustration of the trace-back investigation is shown in Figure 4.7. Very quickly case investigators reconstructed the events of the outbreak. Their trace-back investigation concluded that the method of virus spread to human populations was through contact with monkeypox-infected prairie dogs (animal's body fluids or skin rash); this was in contrast to the outbreak in the DRC where monkeypox spread predominantly via person-to-person contact. The prairie dogs were infected by the monkeypox-carrying rodents at the Illinois animal distributor. Because pet stores from many different states purchased from one distributor, the geographic region that became susceptible drastically expanded. figure 4.7 CDC's trace-back investigation of the monkeypox outbreak. Adapted from the CDC.